Just like humans, with the ageing of your dog, it becomes quite a challenging job for them to carry out an everyday task. Things like getting in and out of the bed often look too much of work because of many difficulties like sore joint and vision impairment. Also, the smaller breed of dogs faces similar challenges while getting inside your car. 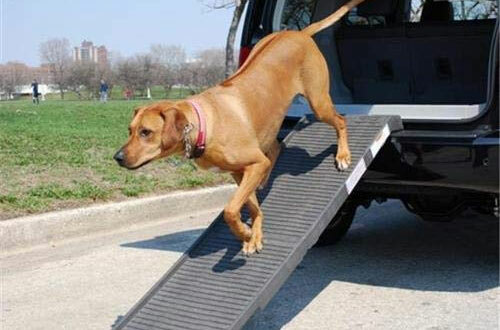 One of the best solutions is getting the dog ramps or pet steps for car or bed that can aid in easy movement when accessing higher grounds. 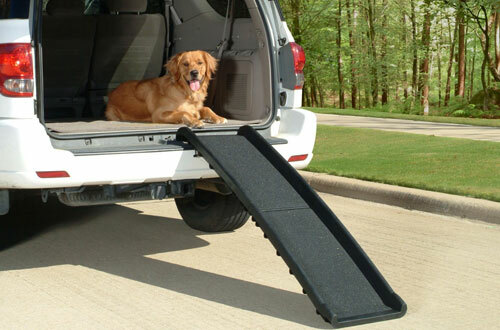 Being made of sturdy materials, these ramps ensure your dogs comfort as well as safety. 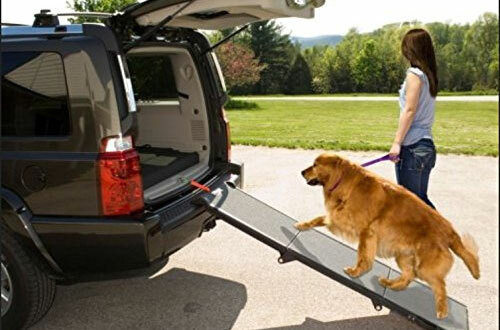 Thus, our buying guide of dog ramps not only helps you choose the right product but will also keep you safe from buying something that will not serve your purpose in the long run. Check these out and we guarantee no wrong choice. Our pets are like our children, so pampering and taking good care of them is second to none important in every scenario. 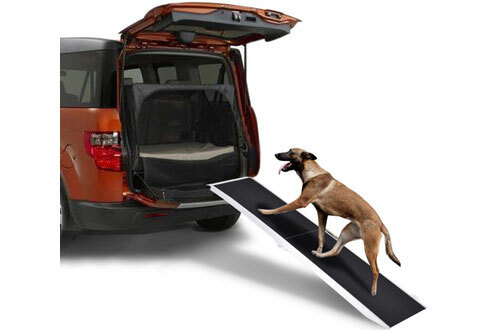 Thus, this is a remarkable dog ramp for a car that has been constructed after consideration of multiple factors. The top has a slip-resistant surface so that your pet never fails a footing even when being restless. 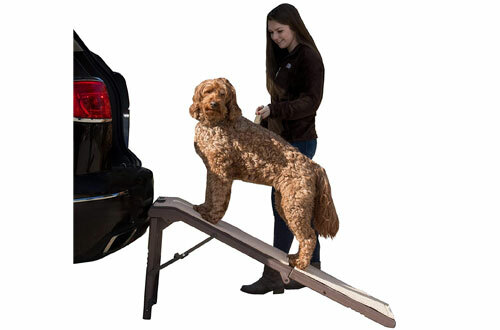 Capable of supporting up to 200 pounds of weight, this is a reliable ramp for various breeds of dogs. Also, it has a large 71-inch of length that reduces the gradient and makes it easy for your pet. Packaging includes safety tether for added protection and also, it is reflective as it comes with contrast markings. Has rubber gripper that holds the ramp steady always. Designed with a moulded handle, making it easier to carry around. This is a completely different design of dog stairs and ramps and is most appropriate for domestic use. It becomes quite struggling for smaller breeds of dogs to get up to the bed or couch, and this is exactly designed to serve that purpose well. On the surface of the ramp, you get a soft supertrax mat that causes zero damage to paws and even can be removed when you feel cleaning is necessary. 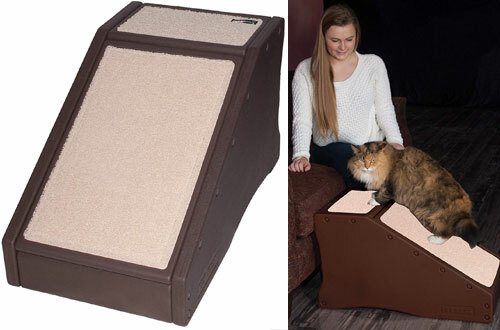 For stability and support, the ramp has rubber grippers on the bottom, assuring your anxious pet is not feeling any worse. Further, this has a combination of Stramp stair for making it more convenient for your naughty pets. Impressive 150 pounds of weight carrying capacity. Lightweight and so makes it very portable and easy to carry. Carved out of real wood for extra durability and reliability, this dog ramp for bed is very supportive and takes care of their accessibility always. The adaptive shape is perfect for most king and queen sized beds in the market. 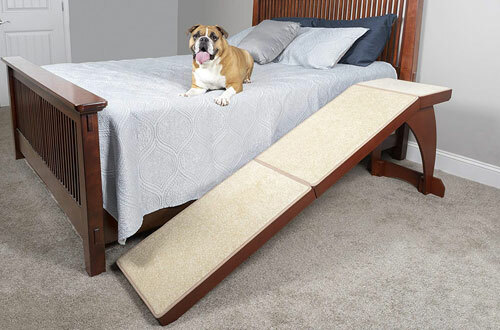 If your dog has been facing challenges to get up to the bed and cuddle you, with this ramp with a rich cherry finish, the issue is resolved. Keeping the shine alive is extremely as you can clean and make it new with use of wood polish and carpet cleaner. Furthermore, the carpeting on top is further thickened so that your dog always feels the right traction while going up and down. Authentic wood construction makes it very durable and strong. Length is long so that the climbing gradient is minimum and easy to climb. Perfect for pets weighing up to 120 pounds. 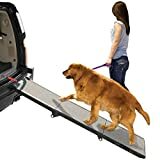 Make life easier for your pet with this carpeted dog ramp that not only helps them reach higher without challenges but also makes them fitter. Pet Gear has lined the top with a pressure activates grip that delivers instantaneous grip to the paws and assuring sure footing in every step. Moreover, the supertraX mat is very soft, thus taking good care of the paws of your dog. The same mat is safe against interiors of your car and can be removed for easier cleaning. In addition to that, the edges have been raised to makes sure your dog does not slip from the sides. 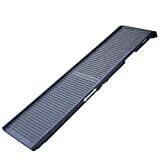 The foldable ramp is very easy to store and transport. The smart shape makes it ideal both for cars and beds. Weight carrying capacity ranges from 200 to 300 pounds. A unique as well as non-slip dog ramp that is very certain for heavy-duty applications, unlike most other ramps in the market, this does not feature a carpet or sandpaper layer on top. Plus, there is a soft and non-slip rubberized walking surface, perfect for both wet and dry conditions. The same surface also takes good care of the paws of your pet. Also, it folds down to half of the size, meaning you can store it and carry it wherever you want. It also comes with ergonomic moulded handles so that carrying it does not look like an issue. Besides, there is a universal non-slip grip that fits almost all kinds of vehicles and edges. Just clean by using normal soap along with water. Totally protected against rusting and corrosion. Made out of advanced composite plastic material which is extremely strong. Suited for large dogs and pets, a weight capacity of 500 pounds. 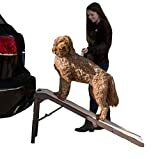 When you are using a ramp, it’s very obvious that you will carry it around to different places for the comfort of your dog. Solvit has manufactured their dog ramp on this basis. With a very less self-weight of 10 pounds and a bi-fold design, carrying it around is very comfortable. As this can be folded into half, it is easy to store when not in use as well. Moreover, the walking surface mimics the ones you find on skateboards, textured for a high amount of traction and zero slipping. Plus, a maximum of 150 pounds can be used for movement. Provided with a convenient handle underneath the railing. Comes with safety release latch to eliminate accidental openings. Has four rubber feet on the bottom for enhancing stability and support. 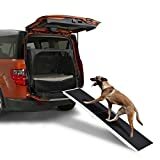 Top-notch in terms of design, looks and functionality, if your dog is entering his old age, own the Gen7 ramp to make it easier for them to get into cars and high beds. It has been designed with a poly grass walking surface that looks and feels like natural grass. This helps in having a good grip while walking and also feels very soft on the paws, thus keeping the paw pads at its best. Furthermore, the walking surface is very wide for easy walking and the ramp is lightweight to carry as well. Also, it is foldable in nature and has soft rubber grip handles for your carrying convenience. Lastly, the dog ramp for high-beds is 72” long and so, it is pretty impressive. A huge 250 pounds of weight carrying capacity. Has automatic locking latch that eliminates risks of accidental opening. Keeps your car interior free from scratches and bruises. It’s very important that you settle for a product that is convenient both for your pet and for yourself. One of the primary factors of consideration is the ease of carrying a dog ramp; hence this tri-fold model is very user-friendly. It folds down to a compact size, making it easier to carry in your vehicle to any place. Plus, there is a skid-resistant walking surface which assures sure footing for your pet always. Impressive in every direction, it is even well suited for dogs that weigh as much as 200 pounds. Folding and opening is very easy and can be done in seconds. The long 71-inch length makes it effortless for your pet to walk on an uphill gradient. Lined with a textured surface that eradicates slipping hassles and delivers traction. If you have decided to get hold of a ramp for your furry friend who has entered the old age, this is one of the finest designed products. 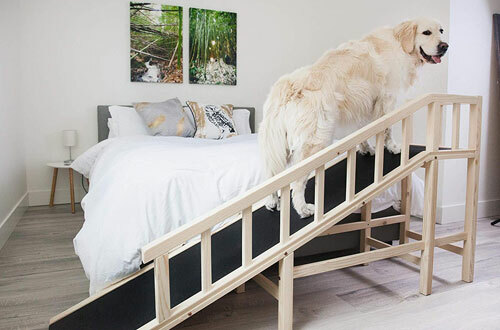 Provided with a wide walking platform, it becomes very easy for your dog to get in and out of your bed. Plus, the pinewood construction is exceptionally durable and reliable, making it a very sure choice. There are even side rails on the ramp to minimize any risks of injuries or falling from sides. Further, a dog of maximum weight limit of 120 pounds is promised safety and ease of accessibility. And even it is made cushiony so that less pressure the dogs feel less pressure on the joints. Has non-slip rubber coating on top of the walking surface. Extremely gradual sloping makes it easier for old age dogs to walk on. Has rubber flooring which ensures at par excellent stability. Guardrails are attached for further protection. 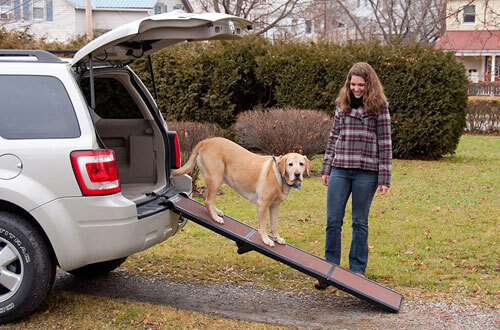 This supremely engineered ramp for dogs from Go Plus is extremely safe in its workability. 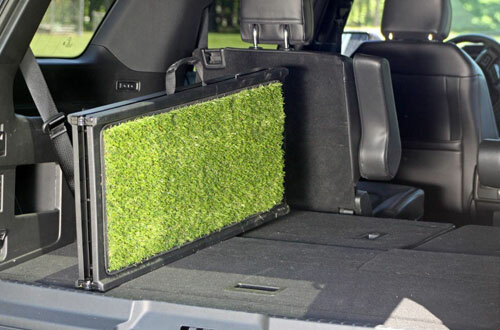 Firstly, it is primarily designed for all kinds of vehicles and SUVs where your dog can get in without any issues or risks. Next, it is provided with a paw-friendly grip tape that is not only healthy for your dog’s paws but can also be used in any given kinds of weather. Moreover, 250 pounds of the maximum weight limit is quite high and appropriate for most breeds of dogs. The ramp can also be folded in half the size when not in use and is crafted with an inbuilt carrying handle for ease of portability. Now, take it out wherever you want without facing any hassles. Made entirely out of aluminium, thus very durable in everyday application. Impressive lightweight construction is easy to carry around. Have locks that prevent accidental opening when folded. Give your pet all the love they deserve and make it more comfortable for them by buying a dog ramp. With a robust design, this water dog ramp is both versatile and highly functional. The design allows it to be compatible with outdoor pools, boats and decks. It does not interfere with your boat ladder, and lets you enjoy yoru time without having to assist your pet. It works by mounting to a surface, and the mesh net lets your dog safely and comfortably enter and exit the water. There are two buoys on either side to ensure it stay afloat as well.